The electric car is spearheading a bold government-sponsored bid to mitigate the damaging effects of gridlocked Britain on the environment. What it won’t do is reduce congestion. The car commute is a bane of modern day-to-day existence. Not only are our lives and sanity suffering as a result of this daily creep through the transit clog but also the environment is withering in a fog of carbon. Of all CO2 pumped into the air in the UK, 35% is caused by domestic transport, with 58% of that caused by motorcars. In an age where carbon emission reduction is one of the hottest political issues of the developed world, the ruinous effects of the motorcar have not gone unnoticed. If the government is to have any hope of meeting its targets to reduce CO2 emissions by 26% by 2020 and 80% by 2050, it knows the car’s weighty carbon output will need to be kerbed. The car has a stranglehold on the UK population that will be impossible to loosen anytime soon. Recent data shows that 71% of commuters in the UK still travel by car. Clearly there is a need to tackle our dependence on the carbon-polluting car by improving the alternatives – more efficient public transport, safe bicycle lanes etc – but in a nation in thrall to their four-wheeled friends, the biggest results will be achieved by reducing the environmental impact of the car itself. The government’s answer is not a groundbreaking new concept, but one that’s been lurking in the shadows as long as motor vehicles have been on the roads - the electric car. Addressing the G8 summit in 2008, British Prime Minister Gordon Brown declared that Britain would be at the forefront of a ‘green car revolution’. He proposed that by 2020 all new cars sold in the country could be electric or hybrid models emitting less than 100g/km of CO2. Up until now the electric car has been viewed by the general public as a rather odd and eccentric vehicle - more expensive toy than road transport for the masses. The government must therefore try to convince the populace that the electric car is just a regular everyday automobile, albeit one that doesn’t make a noise, produces no exhaust fumes, creates only a third of the CO2 emissions of petrol engines, and is both tax free and immune to congestion charges. Not only that but one that will also save the motorist thousands of pounds a year on running costs. In April 2009, the government announced that as part of a £250 million plan to promote low carbon transport they would offer subsidies of up to £5,000 to encourage motorists to invest in electric or plug-in hybrid cars. In a further effort to convince the populace about electric cars, hundreds of models will be available to try out in city centres across the country. The bold strategy for mass low-carbon transport is expected to get off the ground in 2011, when plans for the creation of electric car cities will get underway. The two years in between is needed to address the problem of a lack of practical and ‘regular’ electric road vehicles available. Although electric cars have been on the market for a while, the few models available are of minority appeal because of their limited range of around 40 miles, the several hours required to charge them up, and because they all only had two seats. Drivers have also complained about a lack of oomph in the actual motoring experience. A new generation of all-electric or plug-in petrol-electric cars designed with the regular motorist in mind are expected to begin arriving on the market in around 2011 when the subsidy scheme will become operational. 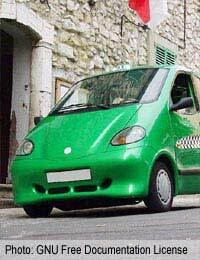 Nevertheless, this will only be the first stage of the green car revolution. The new wave of models will firstly target the day-to-day user, who just needs an urban run-around. Although given that 60% of journeys by car are under 25 miles, this is a major market. The cars would be ideal for commuters, for example. Users could easily charge the car at home, drive it to work and back well within the time needed to have to charge it up again. However, this doesn’t mean you have to return home every time you need to charge up the car. The government’s strategy all includes money set aside for providing charging points and other necessary infrastructure.